“Knowing how to use technology safely and effectively will be incredibly important for these students throughout high school, in college, and in their future careers,” said Neustar President and CEO Lisa Hook. Neustar, Inc. (NYSE: NSR), a trusted, neutral provider of real-time information services and analytics, today hosted a Science, Technology, Engineering, and Mathematics (STEM) Career Event in its San Francisco office to recognize KIPP Bayview Academy scholars who successfully completed the My Digital Life program, a digital education course designed to empower young students to be responsible technology users. Neustar joined forces with leading education technology company, EverFi, to give more than 4,000 students across California access to the My Digital Life program. 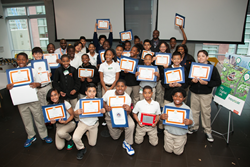 During today’s event, KIPP students learned how important technology is to Neustar’s business and customers. They toured the office, met with Neustar employees who gave them a glimpse of their job responsibilities and listened to Neustar and EverFi executives speak about potential future careers in technology. A representative from Assemblymember David Chiu’s office presented the students with certificates of achievement. Since the My Digital Life program launched, more than 125,000 students in California, Virginia and Kentucky have taken part in it. Neustar offers the digital program to schools as an incentive to teach students digital responsibility skills while highlighting careers in technology. My Digital Life is an interactive, web-based course that combines the power of cutting-edge instructional design, rich media, and real-world simulations to educate teens about technology and careers. The four-hour curriculum informs students on the “nuts and bolts” of how technology works, while placing them in virtual environments to tackle issues including privacy, security, cyber bullying, digital relationships, and the viral nature of the web. Neustar is dedicated to safeguarding the online presence of businesses from cyber attacks and security risks. Identity is at the core of Neustar’s business, which transcends into its corporate social responsibility initiatives by educating students about the risks and rewards of technology. KIPP Bayview Academy is a tuition-free, college-preparatory, public middle school located in the Bayview Hunters Point neighborhood of San Francisco. Since KIPP Bayview opened its doors in 2003, it has consistently proven that with hard work and commitment, traditionally underserved students can achieve outstanding success. The school has a diverse student population: 62% African American, 23% Latino and 12% Asian.